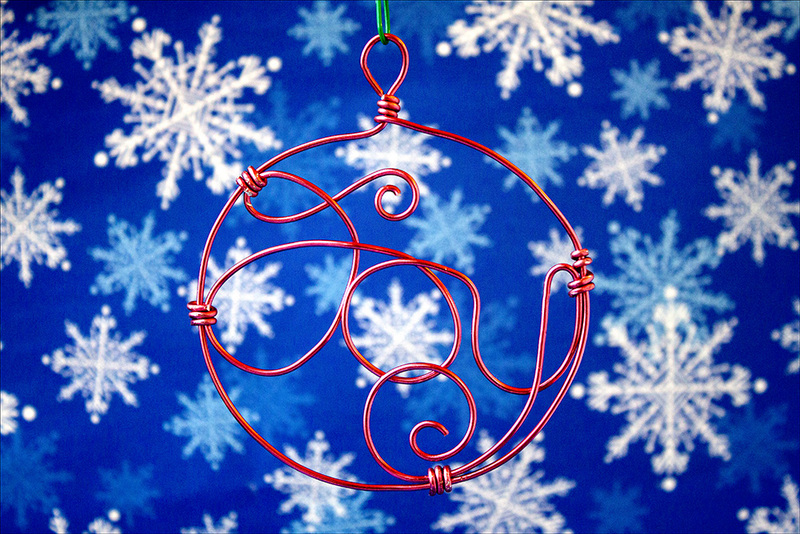 Wire "Joy" Christmas tree ornament. Cheri: While my sis and I were shopping at Hobby Lobby the other day, we were checking out the wire in the jewelry section. Back many years ago when I first started working with wire, I was using baling wire. This is the wire that holds bales of hay together. It was a good thing I was young and my hands were in good shape. Since then wire comes in all shapes and sizes and colors. The wire I picked up for this ornament was really soft, and my hands really appreciated it. I was able to form the letters very smoothly and if I made an adjustment to the wire, it was easy to get the kinks out. This ornament is really quite simple. I shaped the word “Joy” and then I made a big circle with a hanger at the top and placed the word in it. I then took small pieces of wire and held the word in place by wrapping it at various points. I think it turned out very nice and should really add a lot to the ornament tree that we are all working on.